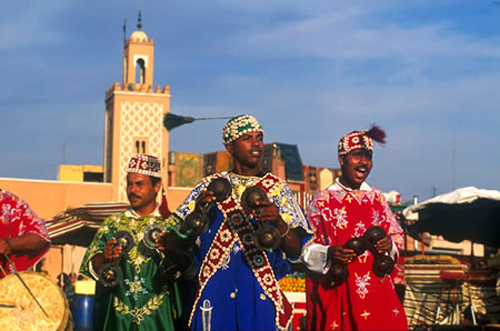 A performance that occurred almost daily in a public square in Marrakech in the early 1980s traded on ethnic identity for fun and profit. The performance began with an Arab duo singing in Arabic; as a crowd began to gather around them, a Berber—a member of a rival ethnic group—leaped into the circle with a song in Tashlit. After a few moments of cacaphony a shouting match began, with the Berber and one of the Arabs trading insults while the other Arab took one side and then the other, upping the ante. “Monkey, block-headed windbag, long-fingernailed King Kong, hick, salt stealer, son of a whore!” Each string of insults was preceded by an ethnic designator, and audience members were encouraged to contribute money to the aggrieved party to demonstrate their own ethnic pride. Occasionally fisticuffs between audience members ensued. The high point of the performance came when the monetarily losing antagonist was figuratively turned into a donkey and the winner climbed onto his back and called for his instrument; victory, however temporary, meant both being on top and singing one’s own song there. This according to “Saints, prostitutes, and rotten sardines: The musical construction of place and ethnicity in a Moroccan insult contest” by Philip D. Schuyler, an essay included in Ethnomusicological encounters with music and musicians: Essays in honor of Robert Garfias (Farnham: Ashgate, 2011, pp. 249–259). Above and below, examples of street music in Marrakech.